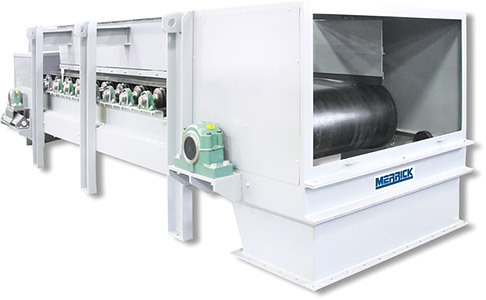 Model 450X Super Duty | Weigh Belt Feeder | MERRICK Industries, Inc.
Flanged infeed section constructed of abrasion resistant steel, custom designed for proper material flow. Totally enclosed, dust confining design with quick removal access panels on all sides of feeder. 18.75” diameter crowned head and tail pulleys to aid in belt tracking. CEMA “E” 6-7” diameter flat, rubber disk impact idlers and steel carrying idlers. Extra heavy duty enclosed screw take-ups. Shaft mounted speed reducer with variable speed AC or DC motor.